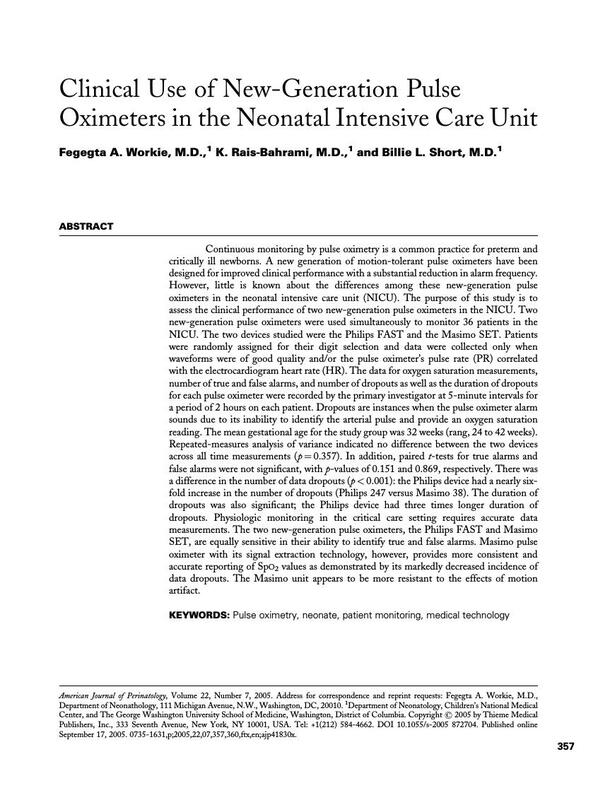 Continuous monitoring by pulse oximetry is a common practice for preterm and critically ill newborns. A new generation of motion-tolerant pulse oximeters have been designed for improved clinical performance with a substantial reduction in alarm frequency. However, little is known about the differences among these new-generation pulse oximeters in the neonatal intensive care unit (NICU). The purpose of this study is to assess the clinical performance of two new-generation pulse oximeters in the NICU. Two new-generation pulse oximeters were used simultaneously to monitor 36 patients in the NICU. The two devices studied were the Philips FAST and the Masimo SET. Patients were randomly assigned for their digit selection and data were collected only when waveforms were of good quality and/or the pulse oximeter's pulse rate (PR) correlated with the electrocardiogram heart rate (HR). The data for oxygen saturation measurements, number of true and false alarms, and number of dropouts as well as the duration of dropouts for each pulse oximeter were recorded by the primary investigator at 5-minute intervals for a period of 2 hours on each patient. Dropouts are instances when the pulse oximeter alarm sounds due to its inability to identify the arterial pulse and provide an oxygen saturation reading. The mean gestational age for the study group was 32 weeks (rang, 24 to 42 weeks). Repeated-measures analysis of variance indicated no difference between the two devices across all time measurements (p = 0.357). In addition, paired t-tests for true alarms and false alarms were not significant, with p-values of 0.151 and 0.869, respectively. There was a difference in the number of data dropouts (p < 0.001): the Philips device had a nearly six-fold increase in the number of dropouts (Philips 247 versus Masimo 38). The duration of dropouts was also significant; the Philips device had three times longer duration of dropouts. Physiologic monitoring in the critical care setting requires accurate data measurements. The two new-generation pulse oximeters, the Philips FAST and Masimo SET, are equally sensitive in their ability to identify true and false alarms. Masimo pulse oximeter with its signal extraction technology, however, provides more consistent and accurate reporting of SpO 2 values as demonstrated by its markedly decreased incidence of data dropouts. The Masimo unit appears to be more resistant to the effects of motion artifact.